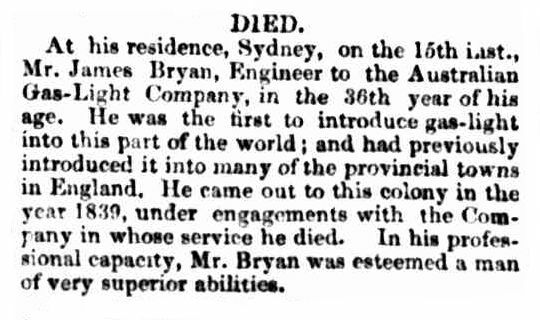 » BRYAN, James BRYAN, James | Cape Banks Family History Society Inc.
James arrived in the colony on 15th May1839 on the ship “Ann” as an Unassisted Immigrant. He was brought out under an engagement with the Company he worked for and introduced gas light into the colony and this part of the world. 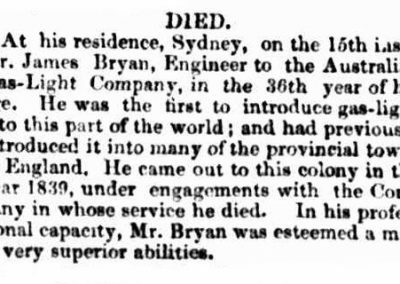 James BRYAN married Ann BUSHBY (nee WALKER), (her second marriage), on 28th October 1843 at St. Philip’s Church, Sydney (Sydney Morning Herald (NSW, 1842 – 1954), Thursday 2 November 1843, Page 3) or St. James Church, Sydney (Dispatch (Sydney, NSW, 1843 – 1844), Saturday 4 November 1843, Page 3). Ann WALKER married Jabez BUSHBY (her first marriage) in London, England on 21st January1835. They had two children: Ann Elizabeth baptised on 15th January 1836 and Jacob Lucas baptised on 6th September 1837. Jabez, Ann and children arrived as Assistant Immigrants on the ship “Siam” on 15 October 1837. 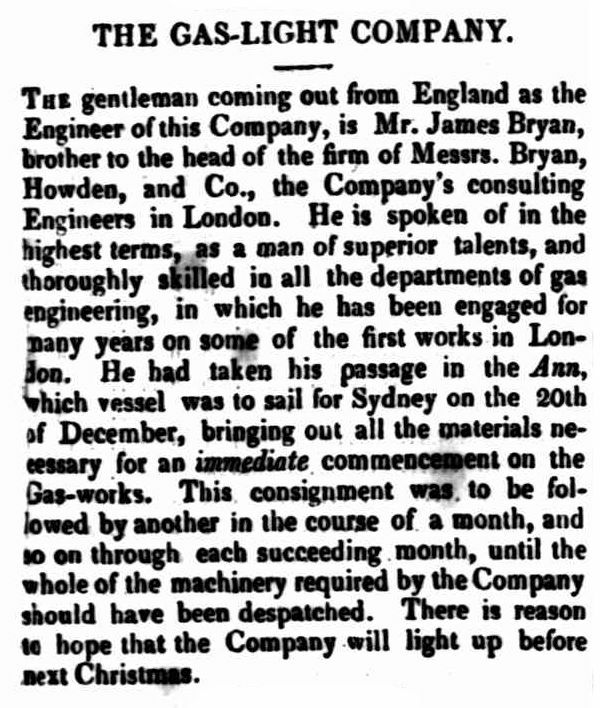 Jabez BUSHBY died on 16th March 1842. Erected to the memory of James BRYAN died 15th January 1845 aged 35 years. He was the first to introduce gaslight in this part of the World. 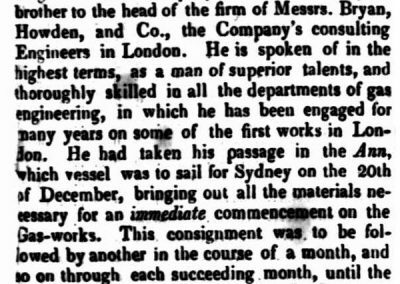 He arrived here in 1839 under an engagement with the Company in whose service he died. Stone erected by Ann BRYAN, relict of Jabez BUSHBY & James BRYAN her two affectionate husbands. Emma Amelia daughter of Jabez & Ann BUSHBY died 13th April 1841 aged 2 years also Jabez BUSHBY father of the above died 17th March 1842 aged 34 years.